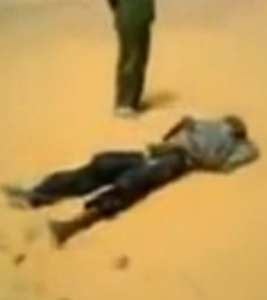 This very graphic video shows how Nigerians (mostly Igbos) trying to cross to Europe through the Sahara Desert die in the desert from lack of water, food and heat. These men, sometimes in a group of 50, attempt to trek from a city in Niger or Morocco via the desert to European countries like Spain and Italy, but some of them don't make it out of the desert alive. Nametalkam, u are a complete combeef to say it's only igbos that do such thing. Ewu hausa. How do you know they are even Nigerians?...Most of the people who travel to Europe today by land are Malians, Senegalese and so on..
U guys see wia una end una lyf 4 land wae no be una own,dia ar so many ways of making legit money in 9geria,jst ask 4 God's wisdom,knowledge & undasting nd it's done. there is too much ignorance in that land......why would you want to walk across the sahara desert ,if not for foolishness. a simple study of geography would have helped them.